By drilling holes into a thin two-dimensional sheet of hexagonal boron nitride with a gallium-focused ion beam, University of Oregon scientists have created artificial atoms that generate single photons. 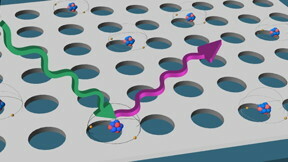 The artificial atoms - which work in air and at room temperature - may be a big step in efforts to develop all-optical quantum computing, said UO physicist Benjamín J. Alemán, principal investigator of a study published in the journal Nano Letters. "Our work provides a source of single photons that could act as carriers of quantum information or as qubits. We've patterned these sources, creating as many as we want, where we want," said Alemán, a member of the UO's Material Science Institute and Center for Optical, Molecular, and Quantum Science. "We'd like to pattern these single photon emitters into circuits or networks on a microchip so they can talk to each other, or to other existing qubits, like solid-state spins or superconducting circuit qubits." Artificial atoms were discovered three years ago in flakes of 2D hexagonal boron nitride, a single insulating layer of alternating boron and nitrogen atoms in a lattice that is also known as white graphene. Alemán is among numerous researchers who are using that discovery to produce and use photons as sources of single photons and qubits in quantum photonic circuits. Traditional approaches for using atoms in quantum research have focused on capturing atoms or ions, and manipulating their spin with lasers so they exhibit quantum superposition, or the ability to be in a simultaneous combination of "off" and "on" states. But such work has required working in vacuum in extremely cold temperatures with sophisticated equipment. Motivated by the observation that artificial atoms are frequently found near an edge, Alemán's team, supported by the National Science Foundation, first created edges in the white graphene by drilling circles 500 nanometers wide and four nanometers deep. The devices were then annealed in oxygen at 850 degrees Celsius (1,562 degrees Fahrenheit) to remove carbon and other residual material and to activate the emitters. Confocal microscopy revealed tiny spots of light coming from the drilled regions. Zooming in, Alemán's team saw that the individual bright spots were emitting light at the lowest possible level--a single photon at a time. The individual photons conceivably could be used as tiny, ultra-sensitive thermometers, in quantum key distribution, or to transfer, store and process quantum information, Alemán said. "The big breakthrough is that we've discovered a simple, scalable way to nanofabricate artificial atoms onto a microchip, and that the artificial atoms work in air and at room temperature," Alemán said. "Our artificial atoms will enable lots of new and powerful technologies. In the future, they could be used for safer, more secure, totally private communications, and much more powerful computers that could design life-saving drugs and help scientists gain a deeper understanding of the universe through quantum computation." Co-authors on paper were UO doctoral students Joshua Ziegler, Rachel Klaiss, Andrew Blaikie and David Miller, and Viva R. Horowitz, a professor of physics at Hamilton College in New York, who spent summer 2018 in Alemán's lab as a visiting professor. The research was done in Alemán's lab, the UO's Center for Advanced Materials Characterization in Oregon (CAMCOR) and the Oregon Rapid Materials Prototyping Facility. The latter, located in CAMCOR, was established in 2016 by an award from the M. J. Murdock Charitable Trust.